I bought my Cub Cadet last summer and I would say it is everything I hoped for. I bought a 50" cut because I have about 3 acres and my old snapper just wasn't "cutting it" ha-ha.. Anyway, before I bought it I compared it to the John Deere model that was similar to the Cub Cadet. The Cub Cadet just seemed to be better build and fit my needs more. The Cub Cadet came with a 24 horse Briggs and Stratton that seems to be more then enough power for me and my need. 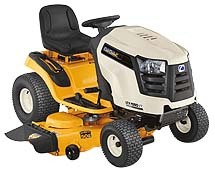 The Pros for my Cub Cadet would be its speed and its ability while mowing to go forward and reverse with just your foot controls. There is no worry about messing with hand controls. Another Pro would be the seat is very comfortable. The cup holder comes in handy as well. The Cons that I found are there is a safety switch that will not let you go in reverse while the blades are engaged unless pull out the switch. It is sort of confusing unless you read the owners manual thoroughly. The second Con I found is the way Cub Cadet fitted the deck with little hose fitting so you can clean the underside of the deck easily. I have found it to be more trouble then it is worth so I just jack the mower up and clean it myself. I recommend this mower to anyone wanting a good product.